Rotana, one of the leading hotel management companies in the region, has announced the soft opening of two hotels in Dubai – the five-star Al Bandar Rotana and a fully-furnished serviced apartments, Al Bandar Arjaan by Rotana, at Dubai Creek. Elegantly designed with a range of modern luxuries, and situated on a prime waterside location on Baniyas Road, the new properties offer expansive views of the creek, which passes through the heart of Dubai, and Burj Khalifa, the tallest building in the world. Away from traffic and in close proximity to major attractions and landmarks in the city, including Dubai International Airport and Dubai World Trade Centre, Al Bandar Rotana and Al Bandar Arjaan by Rotana, which perfectly blend luxury and comfort, and feature state-of-the-art meeting and conference facilities and dining lounges, make an ideal destination for both business and leisure travellers. “Dubai has been one of the best-performing markets for Rotana, where we have a strong presence with an existing inventory of 11 hotels, and several under development which will give us an additional 3,168 rooms in the city. With its forward-looking economy and continued infrastructure investments, combined with its appealing luxury, retail and tourism offerings, the emirate continues to be a magnet for both business and leisure travellers. The emirate has seen a steady growth in the number of visitors and in 2017 alone it welcomed 15.8 million travellers. 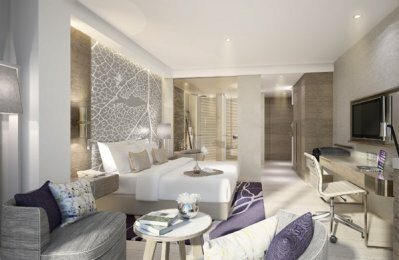 With the opening of Al Bandar Rotana and Al Bandar Arjaan by Rotana, we have reached a new milestone in our growth journey and the properties, situated in a prime location in Dubai, have further cemented our leading position in the hospitality industry,” said David Prince, area vice president. Hussein Hachem, an accomplished hotelier with more than 35 years of experience, is at the helm of the two new hotels.